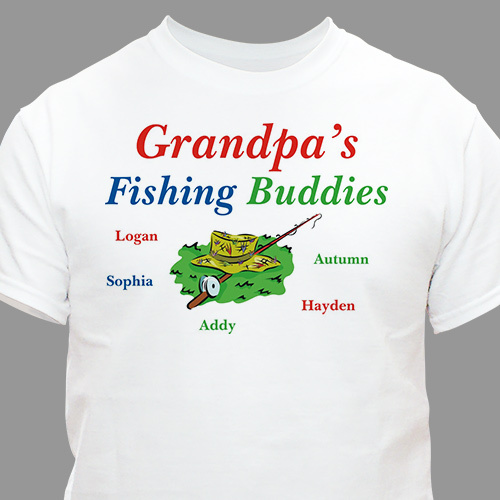 Show Grandpa you're ""hooked"" on him with our Fishing Buddies Personalized T-Shirts. Now Grandpa and Dad can proudly show off the whole family on an attractive and comfortable Personalized Shirt. Our personalized t-shirt is available on a premium white 100% cotton T-Shirt, machine washable in adult sizes S-3XL. Each Personalized Fishing T-shirt includes FREE Personalization. Personalize your Fishing Buddies T-shirt with up to 30 names and any title. My husband loves this shirt & all the other ones I get him from Giftsforyounow. Our Personalized T-shirts are second to none. Get a personalized Shirt for Dad & Grandpa Today! GiftsForYouNow.com features a variety of Personalized Coffee Mugs. Shop GiftsForYouNow.com for all your Birthday Gifts & Father's Day Gifts. Be sure to look at our entire collection of Personalized Fishing And Hunting Gifts for Him. These Personalized Fishing & Hunting Gifts are unique gift ideas for Birthdays, Anniversaries & Christmas.